WWF Tanzania Country office has donated ranger equipment for 200 rangers in the Selous Game Reserve. The equipment that is valued at 50,000 USD was handed over to the Tanzania Wildlife Management Authority (TAWA. The Selous measuring about 50,000 kilometer square is the largest conservation area in Africa with rich wildlife species and numbers and it is a UNESCO’s World Heritage Site since 1982. The reserve lost over 60% of its elephant population from about 104,414 in 1976 to less than 15,086 by October 2014 to poaching. Alarmed by this catastrophic decline, the UNESCO’s World Heritage Committee (WHC) put Selous on the in danger list in 2014. In his speech, the Country Director Dr. Amani Ngusaru commended all the rangers for their tremendous commitment and dedication in protecting natural resources especially the wildlife in the Selous and other reserves and national parks in Tanzania. Dr Ngusaru said It is WWF’s hope that the Ranger equipment donated will assist them in conducting patrols effectively and more efficiently. “We believe that in order for us to obtain high quality anti-poaching work from Rangers proper motivation is necessary and equipping them is but an important motivation leading to achieving zero poaching. The donated Rangers’ equipment have been made possible through fund raising efforts by the WWF network inspired by the good work that is being recorded in Selous Game Reserve where the Manager reports that although elephant poaching is still a challenge in the country, there has been fewer cases of poaching of elephants reported inside the game reserve for the last 18 months”. While receiving the equipment the Wildlife Director Mr. Zahoro Kimwaga appreciated WWF for the continuous support they have been giving TAWA and their contribution in conservation initiatives in the country. He called on rangers to refrain from being involved in illegal activities and value the support from WWF. He said the equipment are indeed a motivation and rangers should not let WWF down and commended rangers for the efforts they are making in achieving that. I want to assure WWF today that TAWA will not slow down, we will continue working hard in fighting illegal activities in the reserve especially poaching because this is what we stand for. To you rangers, WWF has remembered us, valued us and what we are doing we cannot afford to let them down. Lets work together to ensure poaching is completely eliminated”. 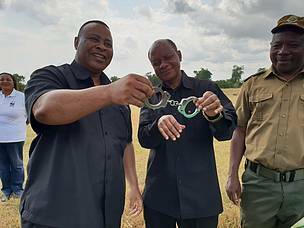 The equipment that have been handed over to TAWA is a contribution by WWF supporters which was inspired by WWF Global Campaign that has been implement by WWF Tanzania for the last two years to minimize threats in the Selous Game Reserve.